The diecast Ferrari 250GTO from Revell in 1/12th scale beautifully depicts one of the icons of motorsport. Big downer is the kits wheels/tires, which look very toylike. 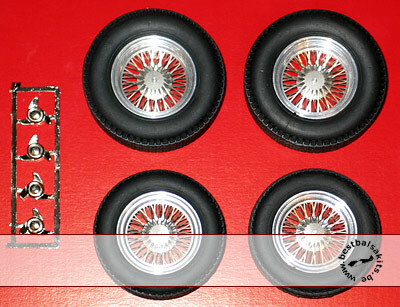 Now here's a solution to this problem with this ALU METAL WHEEL with PE SPOKES & full RUBBER TIRE set that will give it the look it really deserves. Included inset are 4 white metal knock-offs (2L + 2R).